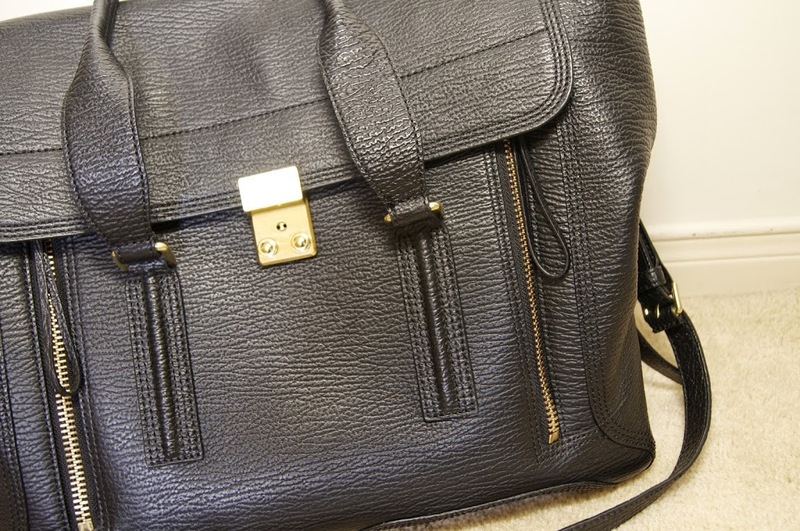 Finally, I have gotten around to writing a full review on my beloved 3.1 Phillip Lim Pashli Satchel per reader request. Truthfully, I never really considered writing a review on this because I didn’t think anyone was all that interested, plus Elle does a pretty good job of it here. But I supposed, everyone loves to read as many opinions on something as they can, so here is my take. 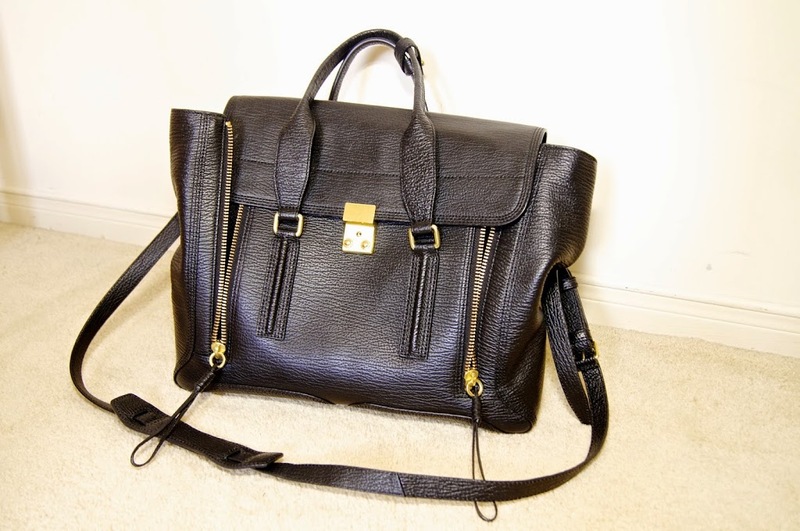 I fell in love with this bag quite a few years ago. I don’t have a whole lot of disposable income (thank you, student loans! ), so I am very selective when it comes to splurging on items. I generally allow myself one big purchase per year, usually, for my birthday. 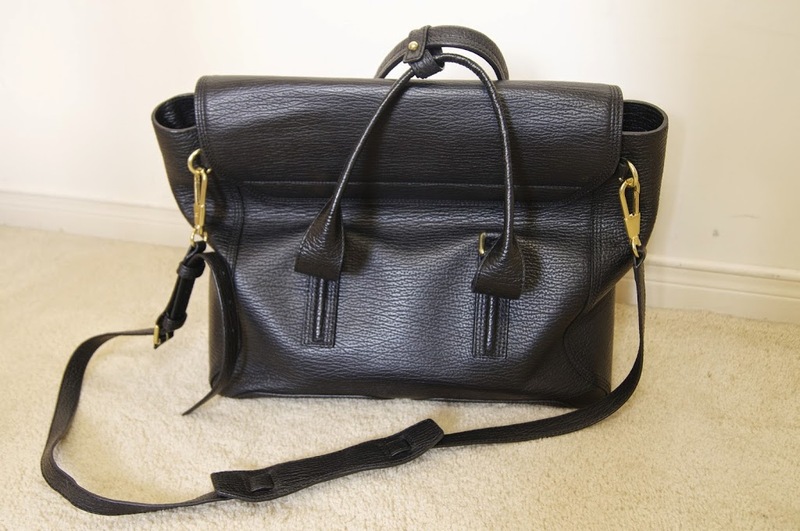 My birthday is in November, so I have had this bag long enough to write a good review on it. Size: I have the full-size satchel and it’s big. And I like it that way even on my small 5’1 frame. I’m not a huge fan of small bags, I’m of the belief that I should “go big, or go home”. Measured it is: 15″ x 11.5″ x 4.5″. 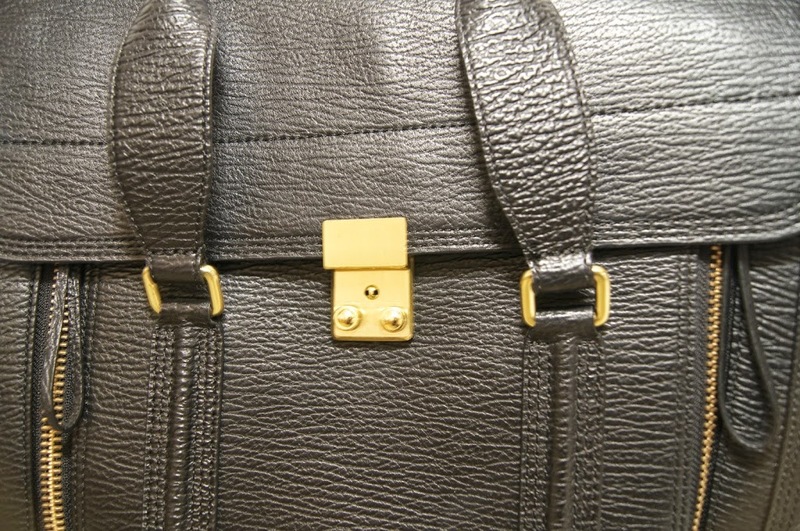 The vertical zipper is functional giving a little more room at the top, if necessary. Personally, I don’t need that much space. I have the ability to do it, because my arms are the size of toothpicks, butit isn’t all that comfortable. Personally, when I’m carrying a lot of heavy stuff, I like to use a tote. This bag on it’s own is kind of on the heavy side. It’s fine for me because I’m used to heavy bags, however, when I start tossing things in there like, an umbrella and a lunch (which for me is usually in a glass container), this thing gets crazy heavy for a daily commute that involves a bit of walking. For that reason, I generally only carry this bag when I’m not carrying a lunch. Actual weight empty is about 2 lbs according to several websites, although I did not weigh this myself. 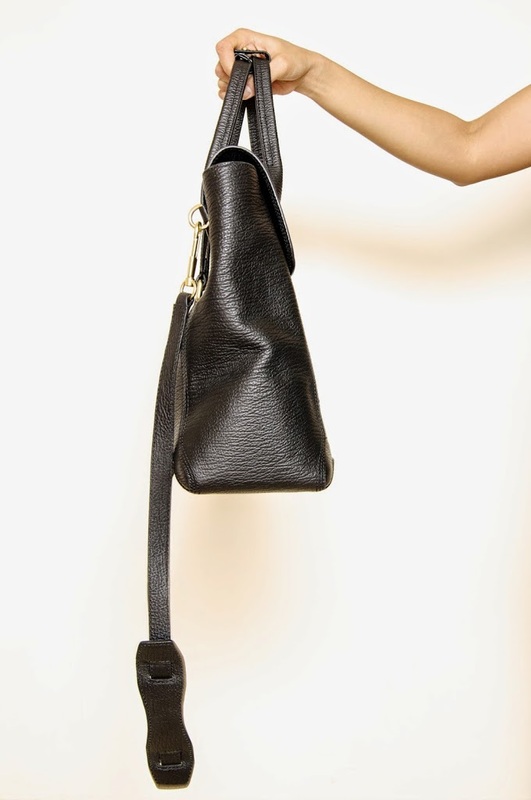 It does come with an adjustable cross-body strap but I’m kind of a wimp when it comes to cross body bags, as they they tend to hurt my shoulder. I didn’t measure, but if you refer to retail websites, they say the strap measures 19″ to 23″. It also has a little clasp around the handstraps, which is a nice detail. I rarely use it, but it’s nice to have that option when you set the bag down. Quality: This shark-embossed leather is extremely durable and resists scratches. At first, I thought I had wanted the smooth leather, but I realized it was too hard to keep scratch-free so I opted for the textured version, and I don’t regret it. The bottom, like most other bags will sink if too many things are carried, so I put in two pieces of cardboard in the bottom to hold its shape. 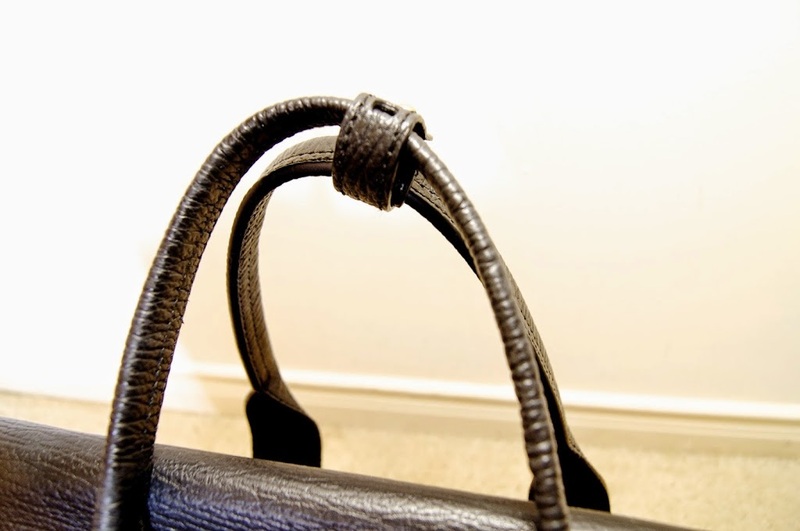 Also, when storing, if you don’t hang the bag, the sides will have a tendency to sink over time despite being a made of a very thick cowhide leather. It is also fully lined, with what appears to be a reasonably thick polyester-like material. Overall it’s very sturdy, however, I will mention the closure is prone to scratches, which is probably not a surprise. Also the ability to close it can be a bit annoying for some. For me, I don’t really care if I can’t shut it in a snap. 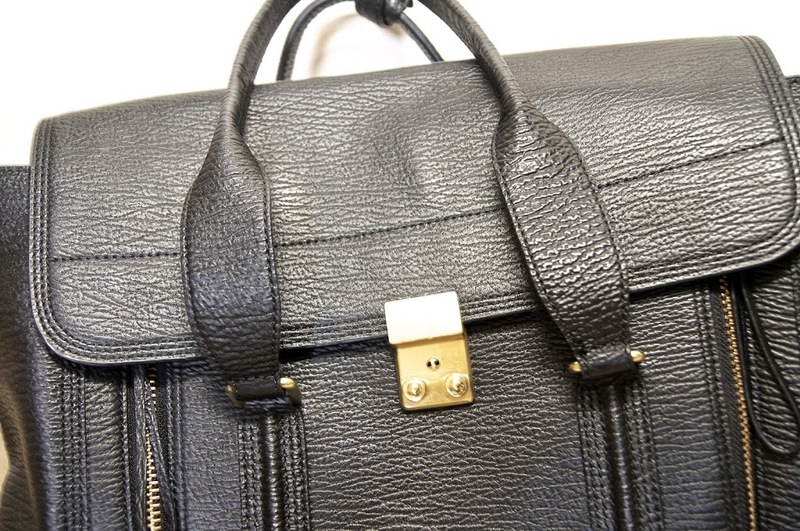 If you line up the clasp properly it close very easily, but sometimes you do have to fumble around with it, particularly if the bag is mostly empty. 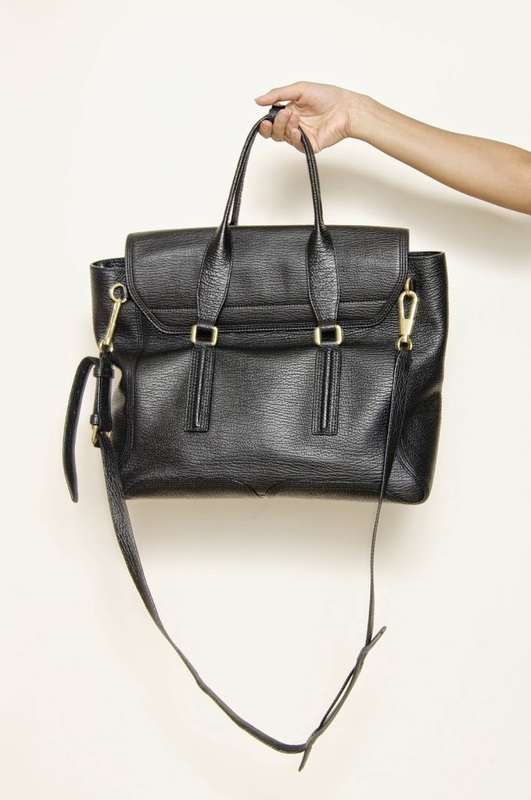 Look: As I mentioned, I love the look of this bag. 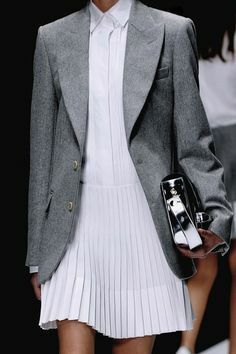 It’s a great size for me, and it’s both work appropriate and has a bit of edge, as well. The inside is also black, so it’s not always the easiest find things inside. 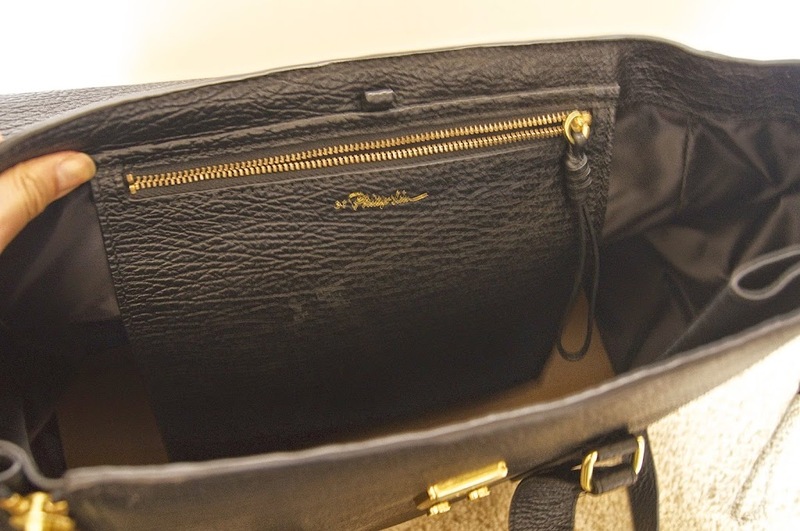 It has one small zipper pocket inside where I can fit my train and work passes. Is it classic? It depends on your style, I suppose. I do not purchase handbags that often, and I do see myself using this for years to come. 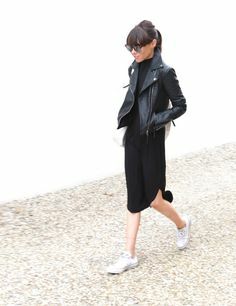 I’ve always loved a minimal and edgy look and I don’t think that will ever change. It is still also sells out on many websites season after season, so its popularity doesn’t seem to waning. Some other Pashli options below! Hi Melissa! 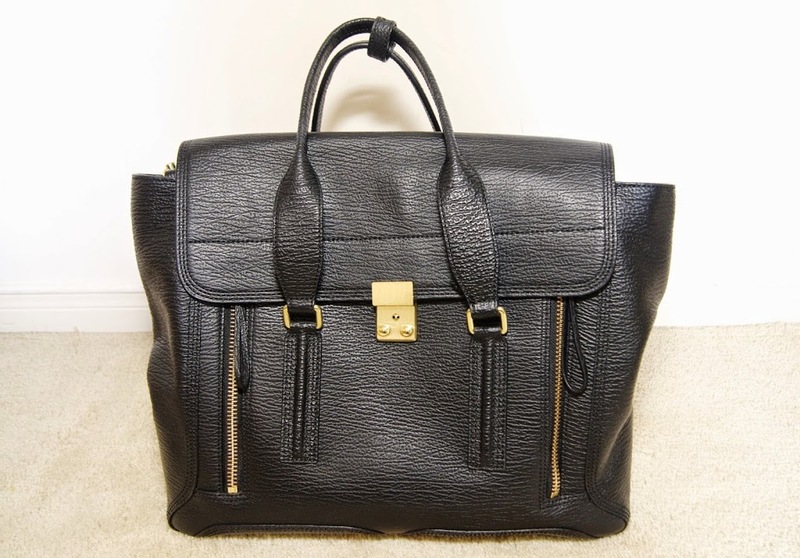 I actually use a Cole Haan Carry-All Tote. I think it’s the Village Tote? I prefer large, very sturdy, simple (plain?) totes for every day. I can easily just throw stuff in it, toss the bag around, throw it over my shoulder, and not worry about getting it dirty or whether it matches with what I’m wearing! It has held up very well considering what I’ve put it through. I was looking at Cole Haan’s current carry-all style the other day, actually. It’s called the Rigby, and it has a lot of potential as a good sturdy, every day carry-all. I hope that helps! Thanks so much! Great review! Lovely review! 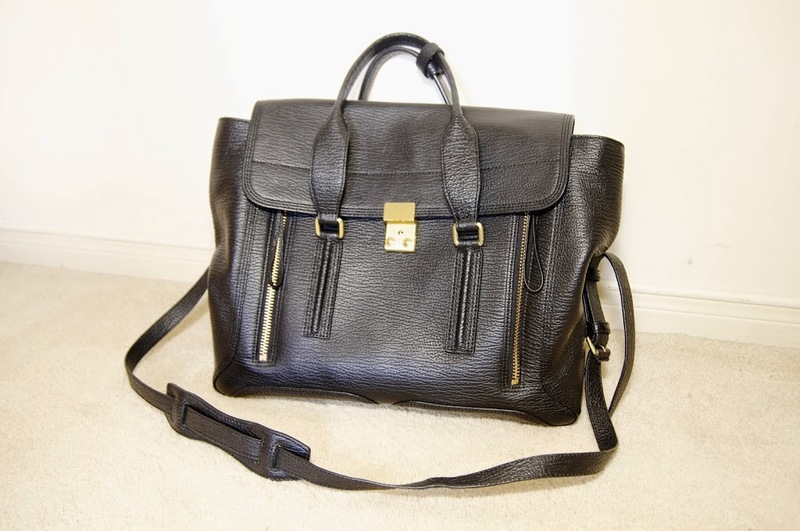 I am looking to buy the bag but i am a bit torn between the medium sized and this large one. I want to use the bag as an everyday bag to uni, so my Macbook air 13″ needs to fit in there along with a couple of books. Do you think a macbook 13″ would fit comfortably in the large sized one? Yes, it will definitely fit! I have a 13″ Macbook (not Air), and it fits with room to spare! Thanks for that review ! Do you think the medium size is also that heavy ? I have no idea! Probably not *as* heavy but still heavy. Wish you wouldve taken a photo of yourself wearing the bag. We are almost the same height (me being slightly shorter) and i really wanna see the bag on you. 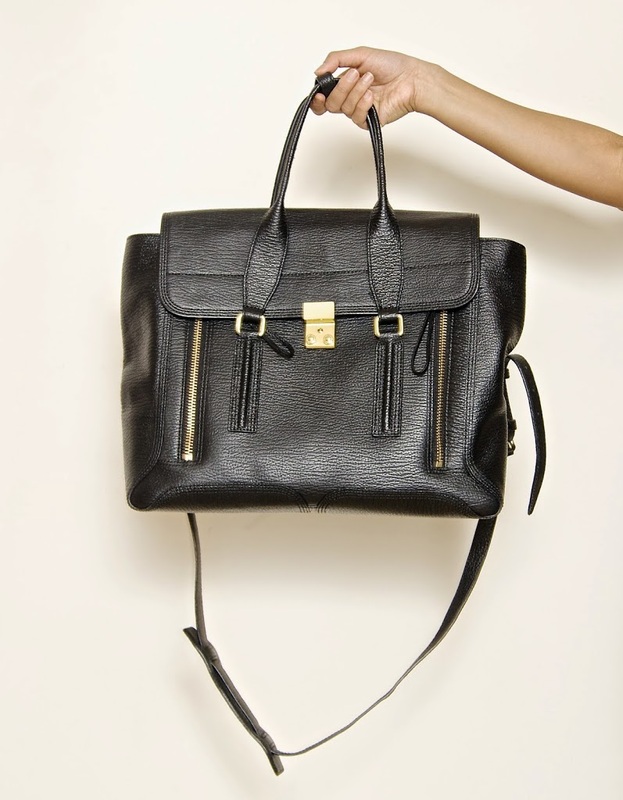 Im planning to get this bag in medium but im afraid it will be too bulky for me. Amanda, if you check out any of my other posts, I wear this bag almost literally every third post. GL on your bag search!